Tuesday, March 27, 2018, Tallahassee – Innovative legislation allowing health care providers to contract directly with patients and employers to provide primary care services without the traditional oversight of the Office of Insurance Regulation was signed into law by Florida Gov. Rick Scott on Friday. The new law, the result of a bill sponsored by Rep. Danny Burgess (R-San Antonio), includes chiropractic physicians among the providers authorized to enter into these agreements. It becomes law on July 1, 2018. Scott’s approval marked the culmination of a four-year effort, originally spearheaded by the National Federation of Independent Business (NFIB) with the support of the FCA and other provider and business groups, to gain legislative approval of this groundbreaking new concept in providing health care services. The new law will allow DC’s among other providers, to enter into direct agreements with employers to provide primary care services to employees as a benefit or make an arrangement with a family to provide care for a monthly fee affordable to the family or an individual. Most importantly, these primary care agreements are exempted from insurance regulation. 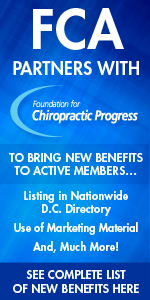 While the earliest version of the proposed legislation did not include DC’s, the FCA working together and as a member of the NFIB, convinced lawmakers chiropractors should be included. The law accordingly defines primary care provider as an allopath, osteopath, chiropractor or nurse who provides primary care to patients. Primary care services is defined as the screening, assessment, diagnosis, and treatment of a patient conducted within the competency and training of the primary care provider for the purpose of promoting health or detecting and managing disease or injury. The FCA sought to include DC’s in this statute not only to provide a new business opportunity and better access to chiropractic care, but, also to express clearly in state statutes that chiropractic physicians provide primary care services. Your FCA is now busy developing a host of new materials to assist you in better understanding this new, exciting concept and how you can best put it to work in your practice. Marketing and promotional guidelines, sample legal agreements, and new educational opportunities are among the many items on our drawing board all aimed at helping you take full advantage of this new law. Be sure to watch for our coming updates.